GRACIE the escapee has made a name for herself at the Holloways Beach shops as a mischief making hen. Gracie the isa brown was blissfully unaware of her of her unfortunate positioning at Holloways Beach recently. 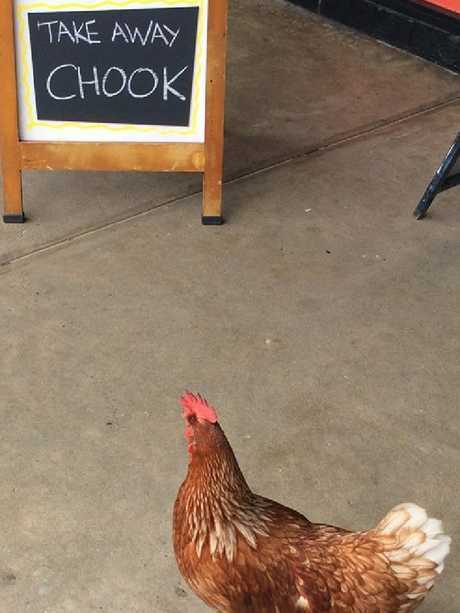 Last week she again managed to break free of her pen and was this time snapped by Bamboo Snack Shack in a compromising position, posing up for a photo in front of a "takeaway chook" sign. After being spotted earlier pondering a bottle of a $12 bottle of red on sale at the Liquorland Holloways Beach store, some suggested she needed the intervention of a 12-step fellowship while others guessed the big wet had forced her out to stock up on supplies. Owner of the cheeky chook Anna Pisk said she had tried to keep the avian escape artist in her Bamboo St pen but somehow she still managed to get free.